Sure, advertising revenue growth is slowing, but are investors overreacting? Note: This article was originally published on Sept. 2, 2015, and was updated on Jan. 13, 2016, to reflect the latest business trends. 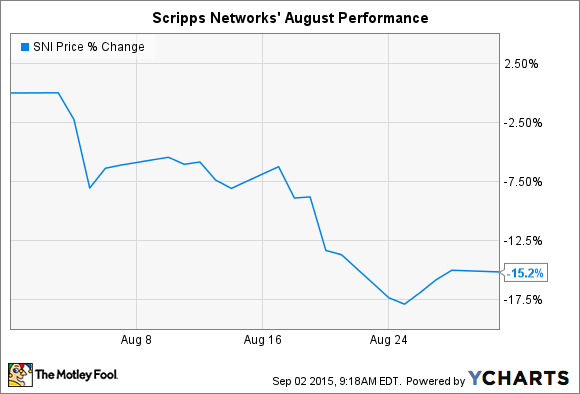 What: Scripps Networks Interactive's (NASDAQ:SNI) stock fell by 15% during the month of August 2015, according to S&P Capital IQ data. The slump left shares of the TV content giant down 35% in the last year. So what: Scripps in early August posted surprisingly strong second-quarter earnings results. Revenue improved by 3% and cost cuts helped earnings jump higher by 39%. The good news for shareholders included ratings gains at HGTV and Food Network channels, the two biggest properties in Scripps' portfolio. Smaller channels also did well: Great American Country, DIY Network, and Cooking Channel each attracted record audiences. HGTV posted its 13th straight month of ratings gains. Source: Scripps. But investors are growing concerned with the TV advertising industry and its ability to continue supporting strong profit growth for networks like Scripps. Marketing dollars are increasingly moving into digital media outlets as consumers reject the type of large cable packages that deliver Scripps' channels into millions of homes. While the company attracts a more affluent demographic than many other networks, its operating results are starting to show the strain of those negative big-picture trends. Advertising revenue is up by just 2% in the nine months ended Sept. 30. And while Scripps' growing affiliate fees have offset that slack, commercial space sales account for 70% of its business. That leaves the network heavily exposed to any long-term drop in the TV advertising market. Now what: But management is expecting a strong fourth quarter for ad sales. In, fact, CEO Kenneth Lowe and his executive team just raised their revenue outlook to 13% from the prior 12% target. "While the third quarter was good, we have lots to look forward to in fourth quarter," he told Wall Street analysts in an early November conference call. Investors who believe that Scripps can navigate the shifting TV landscape over the next few years could have a great deal on their hands. Thanks to general pessimism and a broader market swoon, Scripps' stock is priced at less than 13 times earnings, or close to the cheapest valuation we've seen in over five years. This Billionaire Just Invested in a Beaten-Down Media Stock -- Should You?